1. Degradation of pathogens inside immune cells. We are trying to understand how nanoscale force-generating "Motor" proteins work at a molecular level, and how they collaborate with lipids and cholesterol during the above processes. These findings may help understand how some pathogens (e.g. Mycobacterium Tuberculosis, Salmonella, Leishmania) survive inside our body and infect us. This research also makes specific contribution to understanding fatty liver diseases, and is generally relevant to maladies associated with lipid imbalance (diabetes, obesity, atherosclerosis etc). Cells of our immune system kill pathogens (bacteria, virus, parasites) by enclosing them in a compartment called the phagosome. Before it can be killed, the pathogen is physically transported to execution chambers called lysosomes. 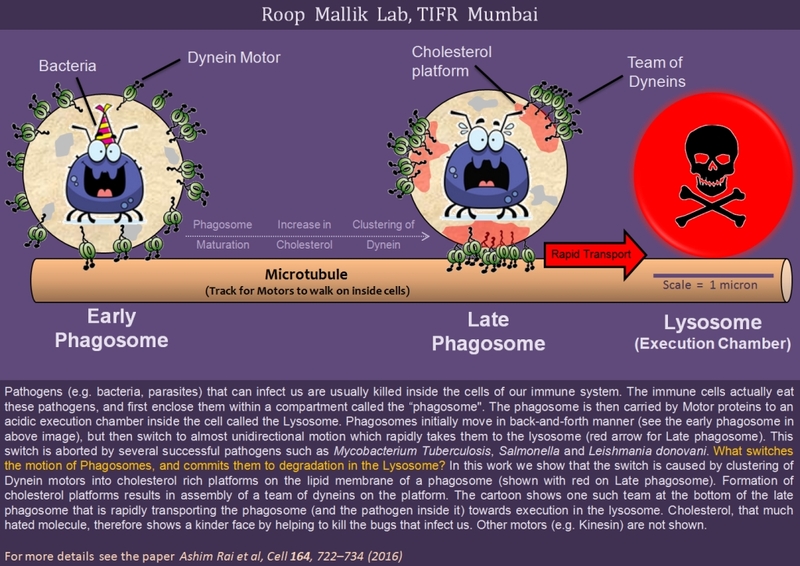 This transport is carried out by motor proteins that can walk around like porters inside the cell, carrying the phagosome. We have measured inside living cells the tiny forces that dynein motors apply when they carry the phagosome to the lysosome. We show that cholesterol is required to cluster many dyneins tightly together on the phagosome membrane. Once clustered, these dyneins now work as a team to carry the pathogen to its execution. We have also shown that a lipid obtained from the parasite Leishmania donovani (causes kala-azar, a disease endemic to India) blocks this clustering of motors and may therefore allow the parasite to survive in our body. Cholesterol, that much dreaded molecule, therefore shows a kinder face that keeps us healthy by helping to kill the bugs. The liver is the key regulator of lipid flux in the body. How lipid is stored and utilized in the liver is therefore central to understanding lipid balance and fatty liver diseases, obesity and diabetes. Most lipid inside cells is stored in micron-sized balls of fat called lipid droplets (LDs). Our work reveals basic mechanisms of how fat inside LDs is utilized to produce energy. We have found that the kinesin motor plays a novel role of tethering LDs to the endoplasmic reticulum inside cells of the liver. Kinesin is recruited into a "lipolytic complex" on hepatic lipid droplets. This recruitment occurs via the COP1 secretory pathway, wherein kinesin interacts with the ARF1 GTPase and phosphatidic acid in a GTP-dependent to control the fate of stored lipid in liver. The presence and function of this lipolytic complex is regulated in a metabolically dependent manner, as evidenced from our studies on liver from normal versus fasted rats. We believe that this work provides new insight into how motor proteins are required for fatty acid regulation in the liver, an area of significant clinical relevance.